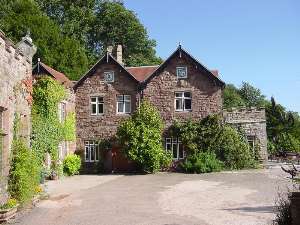 Caer Llan Field Studies & Conference Cen01600 860359work Group HostelCaer Llan is a large country house set in 25 acres of garden, field and woodland in the designated Area of Outstanding Natural Beauty around the lower Wye Valley. Whilst the location enjoys fresh, silent air, the magical scenery is enhanced by the breath-taking views over Monmouthshire and the Vale of Usk. Fully catered Group accommodation is available for up to 55 people, whilst events and functions can also be arranged for up to 100 people. Guests can be assured of a safe and homely environment, with a friendly and welcoming service from the in-house catering team. Groups will have exclusive use of the entire venue. Caer Llan is a large country house set in 25 acres of garden, field and woodland in the designated Area of Outstanding Natural Beauty around the lower Wye Valley. Whilst the location enjoys fresh, silent air, the magical scenery is enhanced by the breath-taking views over Monmouthshire and the Vale of Usk. Established in 1970, Caer Llan is privately owned and run by Peter and Jake Carpenter. Along with a team of dedicated staff, the father and son partnership continues to welcome groups with many diverse interests. Most people who visit never forget their stay, with organisations and individuals returning time after time.